Everyone seems to be talking about slant bar razors, so what are they? The question posed was a simple one, “Soooo… what’s so special about the slant bar razor? Whisper and rumor call it a more aggressive shave. 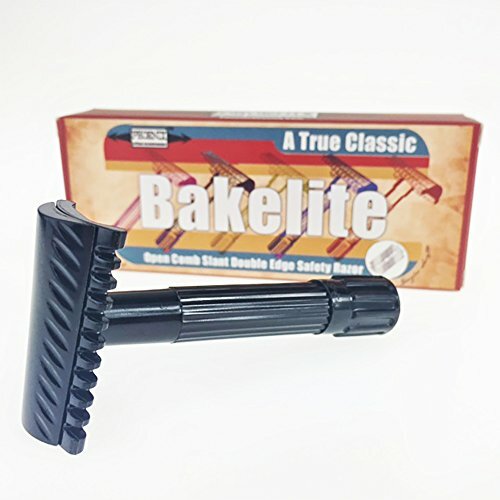 I thought it a bit of a wind-up statement considering how much finesse the safety razor requires, especially considering how often shaving education starts with the commercial cartridge razor. But in the same breath, it’s also called a more advanced razor. Clearly worthy of further scrutiny. As a preamble, it’s worth revisiting the beard itself before we get into the slant bar razor. Obviously beards will be thicker if one shaves less often, the old-timer that shaves once a week before church will need a tad more elbow grease than the guy with the daily morning ritual. But let us not forget our old pal ‘Genetics.’ Men of some cultures have notoriously thick or coarse beards, which in some cases can be directly attributed to increased thickness of hairs, or even multiple hairs growing from the same follicle (true fact). Second to that, rate of beard growth can increase over the life of that same gentleman. At the same time, it’s also worth remembering that some skin is simply more sensitive than the next guy. Having to make more passes with a blade increases the chances of walking around the rest of the morning with a raw face. The double edge safety razor is as much form as it is function. When stood vertically, the cutting edge is perpendicular to the handle. It’s elegant. The razor is designed and built with precision in mind - being perfectly symmetrical is the keystone of that precision. Slant bar razors, on the other hand, are purposely designed to press the blade off-level. We’re talking a few degrees at most, but something you can see with the naked eye. Nearly every one I could find started high on the left, and ended low on the right (for you southpaws out there, it doesn’t seem to matter if you’re a lefty or a righty here). The brilliance of the design of the slant bar razor is that you can fight fire with fire. To explain theory behind it, you’ll have to turn your attention to a related (albeit in an odd way) field: knife skills. The Chef’s Knife is the most versatile tool in the kitchen. Now it’s true that there are many knives to choose from, but the others tend to be ‘specialty’ tools built with a specific purpose in mind. Now it can be argued that in a skilled hand, the Chef’s Knife can be used to do everything so long as the user understands proper technique. The basic shaving stroke taught is closer to a chopping motion. The blade travels in a straight path that is ninety degrees from that of the edge. Think of pushing your Chef’s Knife through a block of hard cheese. Thin slices are easy, quick and precise. Thicker slices however are slower and rely more on strength. Similarly light strokes on your face are imperceptible. Heavy strokes pull on hair and leave you worse for wear (hence the recommendation of multiple light passes). Now think of taking that same Chef’s Knife to a ripe tomato. The chopping motion is more likely to crush than it is to cut, and strength works against you. However, if you lightly rest the blade against the top of that same tomato, and gently pull the blade horizontally, you’ll see a near perfect cut performed with almost no effort. Like with a razor blade, the sharper the edge, the less the effort required. With a little practice, a level knife can slice in a downward 45 degree diagonal motion (a combination of vertically and horizontally) for an efficient cut. The slicing motion cuts more tomato with less strength. Now your goal with your face isn’t the same as your goal with the tomato. A purely horizontal slice is guaranteed to cut your skin (undesirable). A purely vertical motion loses the effect entirely. We’re talking a delicate balance between the two. Somewhere between straight down and 45 degrees down is the sweet spot. So it’s a trade-off. You can learn to shave with less strokes more efficiently (saving time and reducing skin irritation), but the risk of cutting yourself is greater because of human error. Particularly if your morning shaving ritual is compounded by being late for work, chasing a housefull of screaming kids, or just general impatience. The slant bar razor is the happy medium. Because the angle of the blade has changes relative to the actual razor, the user relies less on technique for the same effect. Meaning that a man can perform the same light vertical strokes talked about above, but the new angle of the blade effectively does the work of converting the chopping motion into a slicing motion. All of a sudden, the trade-off between efficiency and self mutilation drops. Is this the road to self-actualization and prosperity? Well… maybe. Remember that every face is different. Some shavers find the difference negligible; on the other hand, some shavers will find this to be a game changer. If you’re a person with a particularly gnarly beard and skin that’s more sensitive to multiple passes, this could be the solution you’ve always dreamed of. Particularly if you’re rocking a decent beard and not just a shade of stubble. The slant bar is still a double edge razor, and this is no time to start skipping steps. Consider attempting your first slant bar shave right after a shower, and make sure you apply a high quality shaving lather for shave comfort and efficiency. Light pressure. As in, even lighter than with the standard double edge. Plenty of shavers stick to the weight of the razor and letting gravity do the rest of the job. Remember what I said about this being an aggressive shave? Some shavers even find THAT to be too much pressure if you’re dealing with one of the models with a longer (heavier) handle. Start with as little pressure as you can manage. About 30 degrees seems to work for most men, follow a straight path. Don’t get married to the first blade you see either. It’s worth dropping some coin on a few different manufacturers. Believe it or not, you will find ones that you like more than others. Some will stick to the old standard of the three passes: One following the grain of the beard, one lateral, and one against (or a second lateral pass for sensitive spots). However, this is a more aggressive shave, so all things being equal you should be able to shave off more with less work. You might still prefer the three passes (a good place to start), or you might chuck some of that. Hey, it’s your face, experiment and find out what works. For wet shave advocates, this is the go-to model for slant bars. German-manufactured, balanced, compact, knurled grip. Stainless steel finish, guard bar (rather than comb), compatible with just about any blade and will likely outlive you. For those looking to jump in with both feet, you need look no further. There’s a bit of a debate raging around this razor. The first thing to realize is that the difference between the 37c and the 39c is the length of the handle, and the associated weight. It’s strictly a preference thing. That being said, the extra weight does affect the pressure you’ll need to use shaving (but nothing world changing). I have heard that some of the female users like the longer handle more for leg shaving, but I can’t speak from personal experience. The other point worth bringing up is that there is some confusion about the name, since some marketers have added titles like ‘HD’, ‘Barber Pole’, or ‘Sledgehammer’. They’re all the same thing. This little fella is unique for it’s lack of metal. The fact that double edge razors are made of solid metal is usually one of the main selling points. This slant bar turns that on its head by producing something high quality. Chip resistant and rust proof, Fine gives you an entryway into slant bar razors that looks nice but costs less. Doubtful that it will last as long as a steel model, but if you’re not sure the slant bar will be your thing and price is the final barrier, give this guy a whirl. Slant bar razor -- shaving panacea? That’s 100% true for some, and there are definitely shavers that don’t have to deal with wild-man beards or sensitive skin that try it and turn around liking it more than the standard double edge. User preference. You might hear some say the slant bar razor should be your second razor, citing the increased level of skill required. Personally I’m a fan of jumping in with both feet - the real skill you need is patience. You’ll learn more by doing. Cuts and nicks can and will happen sooner or later (even with a cartridge razor). Treat shaving as what it is - a finesse skill - and you’ll do fine. Merkur 34c review – Why is this such a popular safety razor?